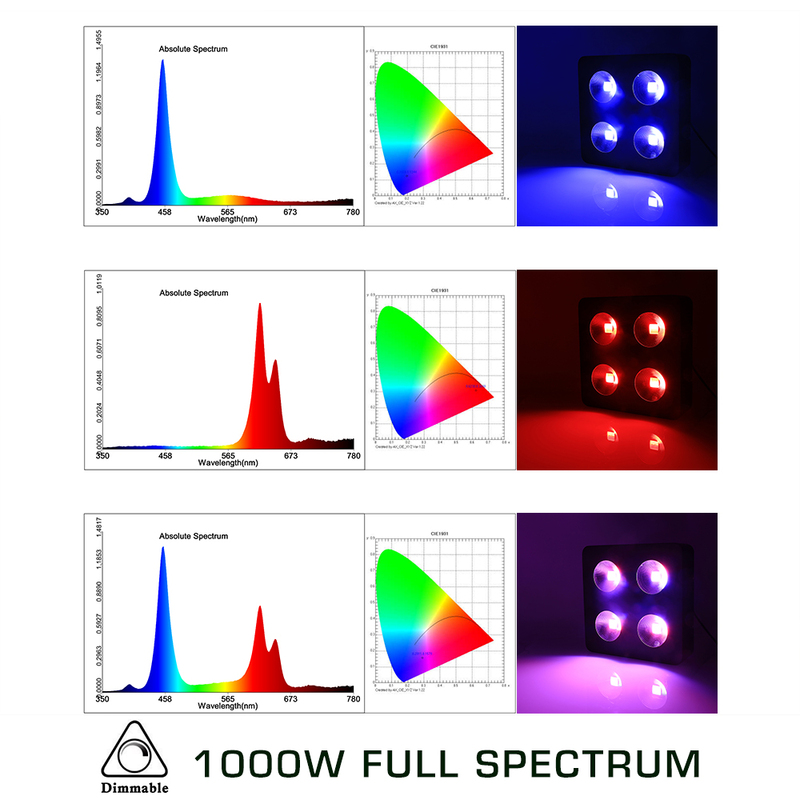 Compared to normal LED grow light by the secondary lens and normal single lens, our latest integrated COB of LEDs effectively improves much the color uniformity and luminous efficiency, which makes it more powerful in the vegetative stage and blooming stage of your plants. Ideal for all phases of plant growth can be used in the house garden, pot culture, garden, sowing, breeding, farm, flower exhibition, bonsai, garden, greenhouse, sowing, breeding, farm, greenhouse cultivation, water-soluble breeding, greenhouse cultivation, pipeline cultivation and so on. Best Heat Dissipation for the. Best Stability and Longest Lifetime. 1.Q:How high dose the light have to be above the plants? A:it is very very bright, and you need set the light at least 2ft above the plants. 2.Q:How many 1500w lights do i need for a 4x4 tent? 3.Q:How mang hours can I run this light per day? A:You can put it always on ,the cooling fan is very very good,it will keep the light in a low temperature. also you need set the working time according your plants and the stage of growing. 4.Q:how many fans in the light? A:there are four fans in the light, and they keep the light in a low temperature and long lifespan. 5.Q:Can it be used for starting seeds?